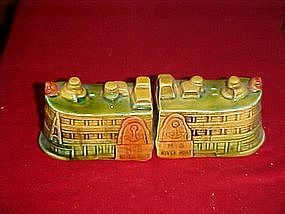 Vintage hand painted ceramic salt and pepper shakers. All glazed, no cold paint. Each river boat measures 2" tall and is 2 3/4" long. M&S River boat, plastic stoppers. Perfect condition.